Monday morning, I woke up, slid out of bed, and was immediately cold. We have our thermostat set so that, from 8 PM to 6 AM, the heat doesn't kick on until it gets down to sixty degrees in our house. By the time I get up, the heat has been on for thirty minutes, and it's usually several degrees warmer than sixty. Monday morning it seemed significantly colder than usual, but it wasn't until I went downstairs and inspected the Nest only to find that it was dead that I used my amazing powers of deductive reasoning to puzzle out that something was wrong with our heating system. Derek and I tinkered with the thermostat and the furnace in the basement for quite some time Monday night- well, Derek tinkered and I held a flashlight like a boss, and by "like a boss" I mean my right shoulder was sore the next day from holding a small, lightweight object up for so long. That is how sad my upper body strength is. I also flipped a number of switches back and forth in the circuit breaker- fuse box- thingy. I feel like I need to make a t-shirt that has "Big Helper" written on it in childlike crayon. Derek and his Big Helper determined that it wasn't the thermostat, so it must be a problem with the furnace. I called a furnace... guy... (heating service technician? I have no idea what the proper terminology is for this kind of thing. Indoor temperature journeyman? I bet that's it.) and he came out and did stuff to the furnace (or renegotiated the basement elves' contract, for all I know), had it working again in thirty minutes. Hallelujah! Two cold mornings were more than enough for me. Ah, but do you know what we think caused the whole problem with the furnace? Our boys. Naturally. Sunday afternoon the boys were desperate to play basketball, but it was too cold for my bones outside, and I was tired, and [insert whatever excuse sounds good to you here], so I was not about to walk them to park for some sportsing. I just wasn't. Then they began begging to play with the small hoop we currently have stored in our basement. I said no. They begged. I said no. They begged some more. I finally caved, and sat on the basement stairs watching them toss a small, soft ball through a hoop over and over. At one point, when I went upstairs for mere minutes to check on the welfare of our other child, our two dear sons managed to knock something over into the furnace. I heard the crash, asked what had happened, and told them to get upstairs, basement playtime was done. Forever. Two chilly days and a service fee later, I have learned my lesson. I'm just thankful it's March, not January, when a hiccupping heater could have been dangerous, and that the furnace is the only thing the boys managed to break, not, say, our entire house. Now, when they were babies, I did not expect a future replete with the wanton destruction these boys seem hell-bent on, but I likewise couldn't have predicted the crazy, excessive, lovely, lovely affection they shower on us. They are the first to give hugs and dart forward to help out and rub my back if I seem even the least bit tired. 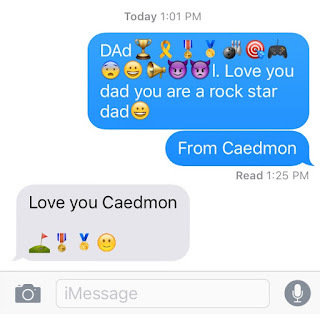 Monday Caedmon asked if he could use my phone to send his Daddy a text message. It took him a good twenty minutes to very seriously peck out and send the following. 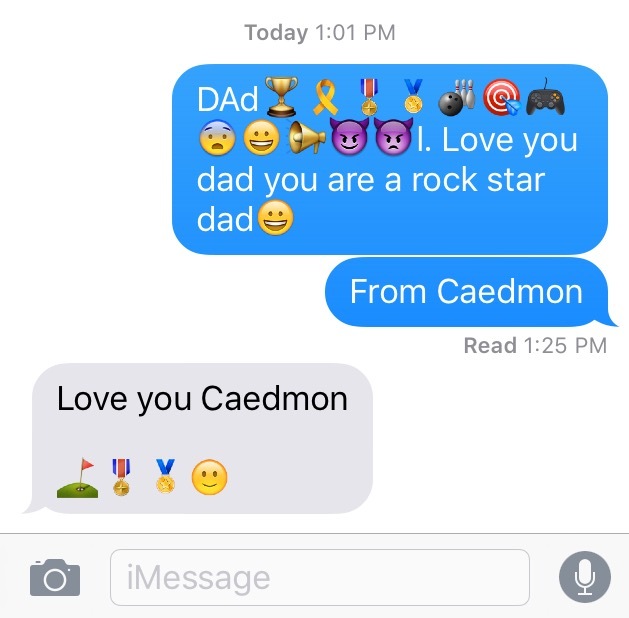 No one has ever been as happy to get a text message as Caedmon is when there's a message for him from Derek on my phone. He stares at the screen raptly for far longer than it takes to actually read it. I don't know if he's memorizing the emojis, or meditating, or what. Then there's Atticus, who completes a "Would You Rather..." worksheet at school every week, most of which I have kept because his responses are priceless. ("I would rather be a rock star than president. Because I would sing to everyone. I would not take naps.") This one was quintessentially Atticus. "I would Rather Be big. Because you would win lots of Badlls [battles]. Because your King would be God. That is why I would Rather Be big." Somehow the kid who, yes, loves battles and God is also the most tender-hearted of our children, sensitive but emotionally in tune to those around him. He's also the one who is so single-minded when playing backyard soccer with the family that he pays no attention to the jerk tree he's run into/ is clearly out to get him. That thing extends down onto to his neck. To answer your questions, 1) Yes, he's already much better, as he is seven years old, and when you are seven you enjoy almost magical healing powers; 2) Yes, Derek and I have been calling him Scarface, but privately, as remember? He's kind of a sensitive kid; and 3) Yes, I did say a superduper fervent prayer of thanksgiving that it wasn't a couple inches to the right, although that would have made Halloween costume decisions relatively easy for the rest of his life. "Hmm, which pirate do I want to be this year?" I was tooling along in this post and chuckling and shaking my head at Stuff Boys Break. I love the text messages! Then I saw that scar. That looks like seriously painful stuff. But yes, fortunate that it didn't affect his eye. I like those "Would you rather" prompts. My kids are always asking much more gruesome stuff beginning with "Would you rather." Your son implies that rock stars don't get naps but presidents do. If so, I pick president, for that reason alone.